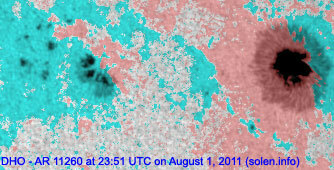 The geomagnetic field was quiet on August 2. Solar wind speed ranged between 356 and 516 km/s. 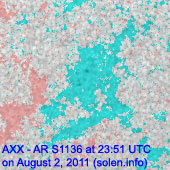 Solar flux measured at 20h UTC on 2.8 GHz was 121.6 (increasing 37.0 over the last solar rotation). The planetary A index was 3 (STAR Ap - based on the mean of three hour interval ap indices: 3.4). Three hour interval K indices: 21001101 (planetary), 21111211 (Boulder). Region 11260 decayed slowly and quietly. Region 11261 lost many small spots, however, the main penumbrae are magnetically complex and contain significant delta structures. A major proton event is possible. Flares: long duration M1.4/1N peaking at 06:19 (associated with type II and IV radio sweeps and an Earth directed CME), C2.0 at 09:27, C1.1 at 17:23 UTC. 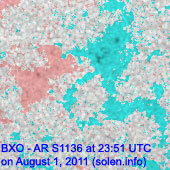 The region was the source of a long duration M1.1 event peaking at 03:37 UTC on August 3. 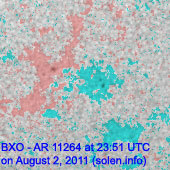 Region 11263 developed further and has a complex trailing penumbra with 2 magnetic delta structures. Major flares are possible. 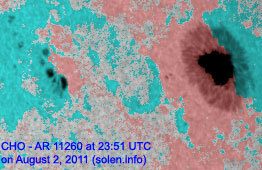 Flare: C1.2 at 03:14, C1.2 at 04:00, C2.0 at 11:39 UTC. 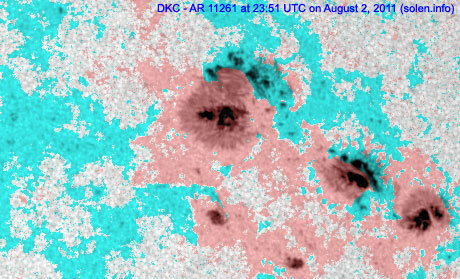 This region was the source of an M1.7 impulsive flare at 04:32 UTC on August 3. Region 11264 reemerged with a couple of spots. 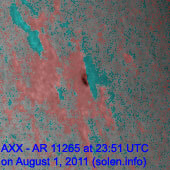 Region 11265 rotated quietly to the northwest limb. Minor update added at 14:30 UTC on August 3: Region 11261 produced a major M6.0 long duration event peaking at 13:48 UTC. 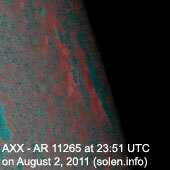 What appears to be another earthbound CME was visible as early as 13:55 UTC in STEREO images. Minor update added at 17:20 UTC: The main magnetic delta structure in region 11261 has very strong gradients with the opposite polarity umbrae hard to separate visually. The CME produced earlier today was full halo and could reach Earth on August 5. The latest high resolution CHARMAP. 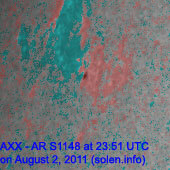 July 31 - August 1: No obviously earth directed CMEs were observed. 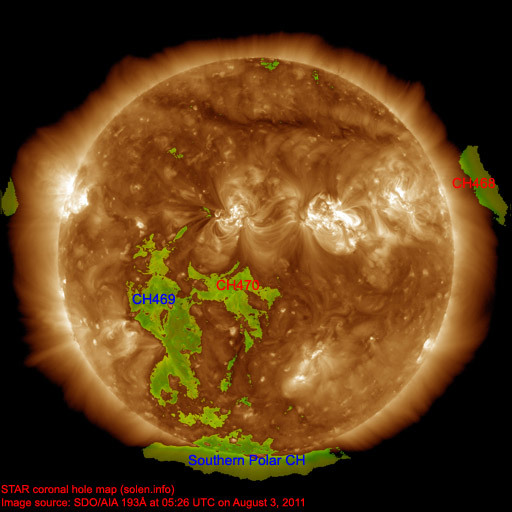 A recurrent coronal hole (CH469) in the southern hemisphere could rotate into an Earth facing position on August 3-4. 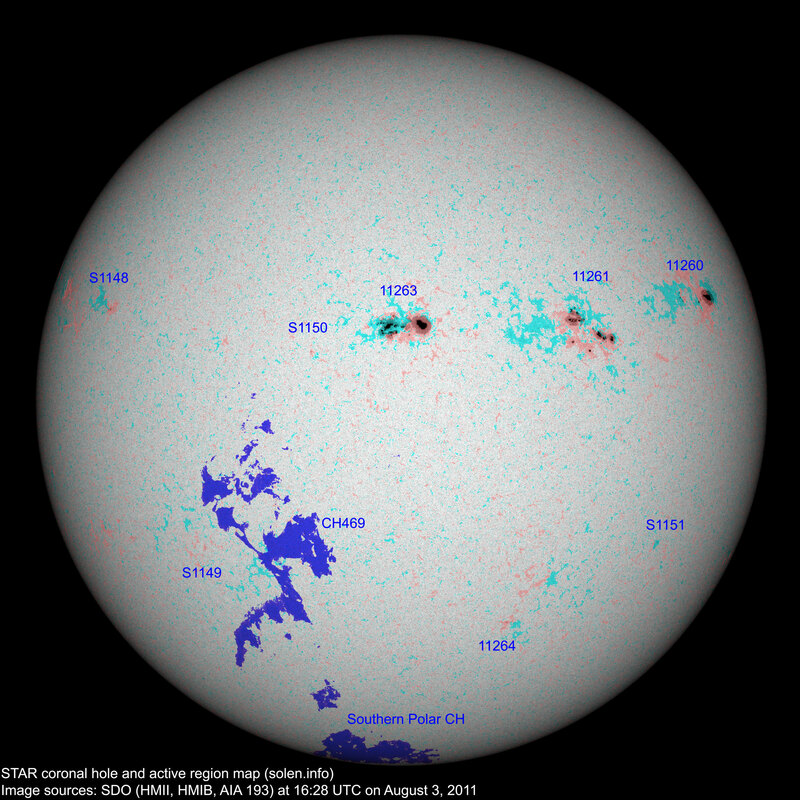 The geomagnetic field is expected to be quiet on August 3. 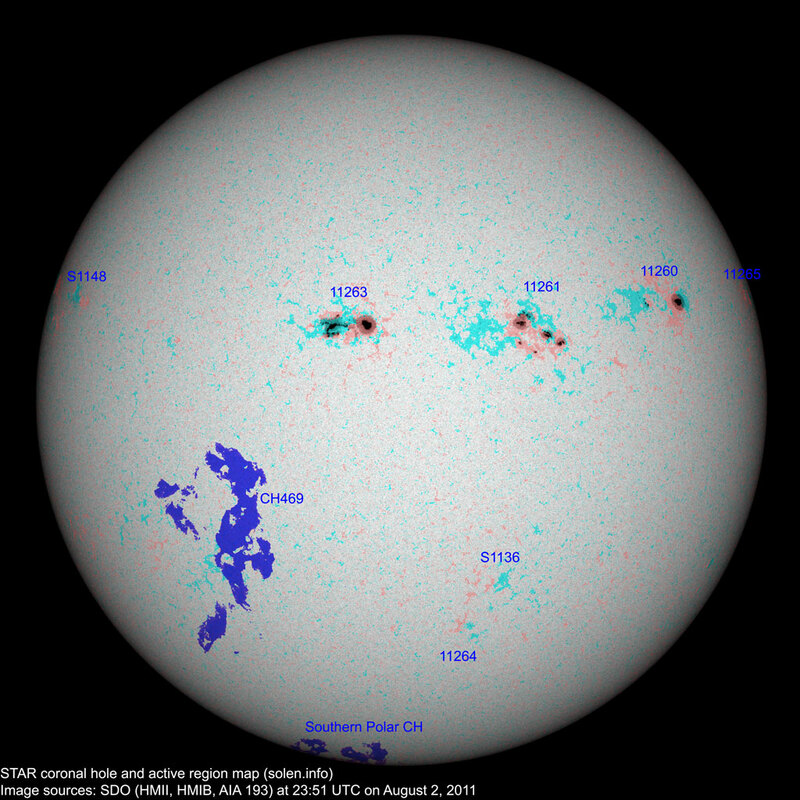 On August 4 a CME impact is likely and could cause active to major storm conditions that day and on August 5.